Köln Kerstmarkten – Possibly Netherlandish. So a couple of months ago, I told everyone that I would be discussing places in the Netherlands, and then right away, feature a place like Cologne (Koln) that is not within it. Sometimes I’ll deviate from the script, I guess. Since it is December, I thought it might be fun to feature Christmas events, and it would be inexcusable to not include a German Christmas market. Every other event discussed this month will be in the Netherlands. Also, we bought a very used car this summer, and were itching for a road trip – Cologne is about two and a half hours away, I had some time off for Thanksgiving, and we figured, why not? Cologne has eight Kerstmarkten (Christmas Markets) and we made it to five. Each market has its own theme and serves its own gluwein – a spiced and warm red wine served in its own mug. Gluwein is an acquired taste, and I acquired it more than Manon. The markets were crowded, but we were able to scout them out on Thanksgiving – which was by far the least crowded day, since it was drizzling and a work day for most folks. Waffles – what’s the point of life if you can’t enjoy a good waffle every once in awhile? Potato pancakes with apple sauce – My theory is that there is a negative correlation between generosity and deliciousness. They are better crispy and not soggy. They really hit the spot when we were cold and hungry. Curry wurst – the brats and/or curry wurst are a must. They were affordable and the portions were generous. 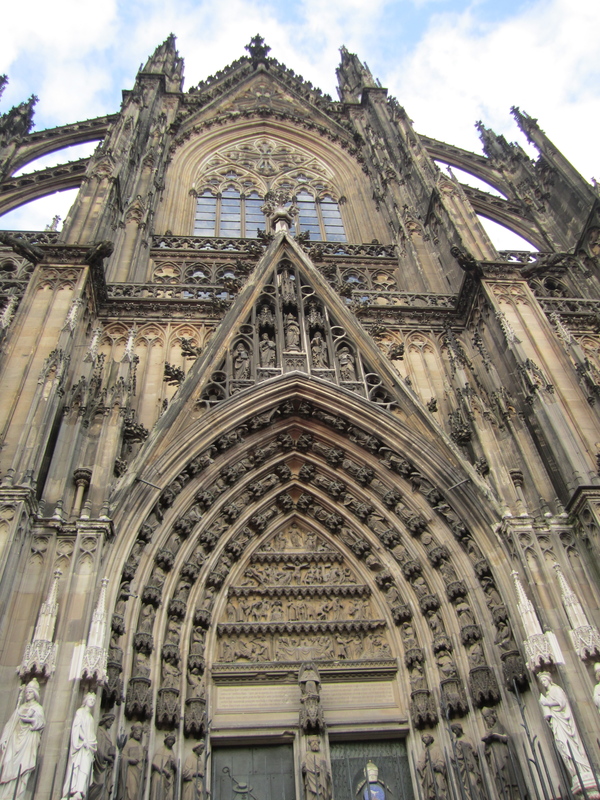 Cologne Cathedral may have been one of the most impressive buildings i’ve ever seen. The cathedral was built to house the shrine for the Three Magi, or Three Wise Men. Work began on the Cathedral in the Middle Ages (1248 AD), and was halted two hundred years later when the funding ran out. It didn’t resume again in the 19th century – and when construction began again, the builders followed the original architect’s plan. If you’ll look at the top left, the picture below shows scaffolding on the top left spire – they were doing maintenance work when we were there. 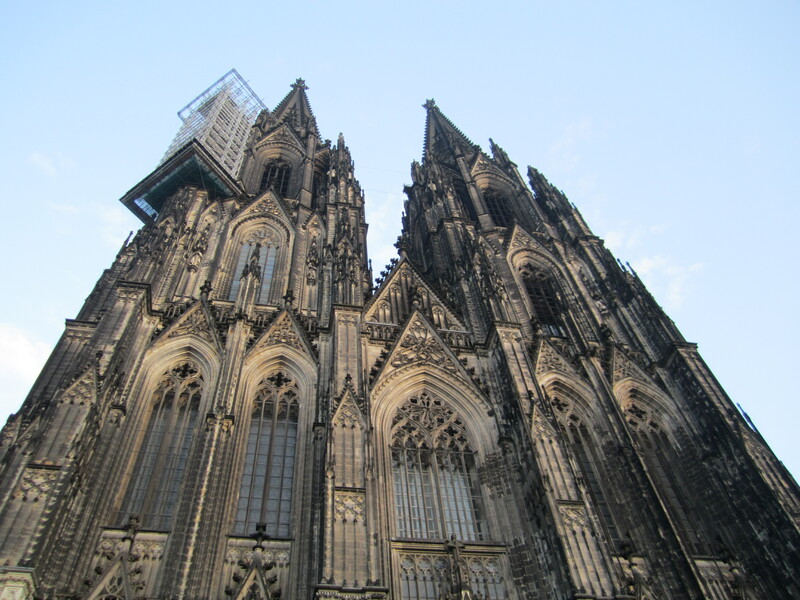 That’s apparently common – there’s an urban legend that when the Cologne cathedral is finally finished the world will end. The newest addition (2008) was a stained glass window titled “Symphony of Light” added to replace the one that was destroyed during WWII. It was designed by Gerhard Richter, a local Cologne artist. If the colors in the window look like pixels, that’s because they are. 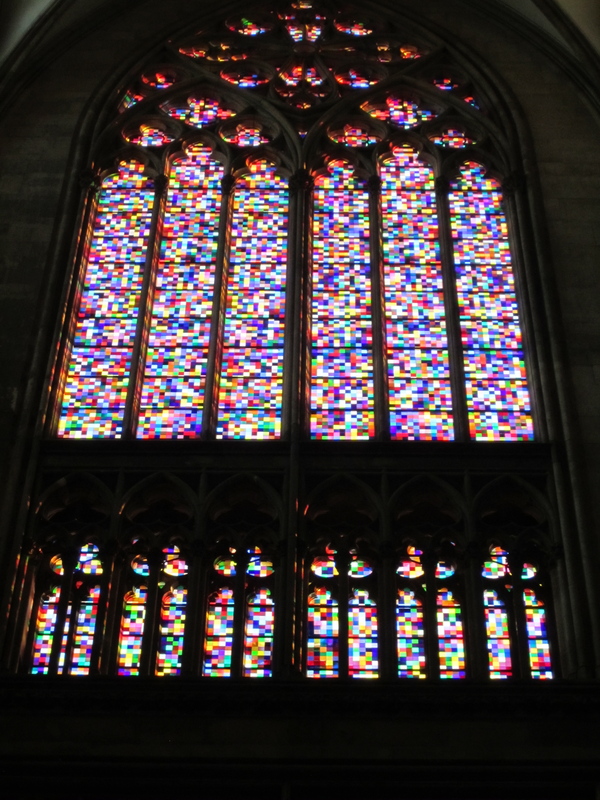 Richter sampled the colors used in the other stained glass windows, put them in his computer, and had the computer randomly generate an image. When I saw the window, I was drawn to it; it’s brighter than the other windows, and the light it lets in is gorgeous. Being away from it, I’m a little more ambivalent – I’m not sure it will stand the test of time, artistically, or even physically – the window is made of silicone, and according to our tour guide – no one knows how stable it will be as it ages. Fruh -Früh am Dom, Am Hof 12-18, 50667 Köln. An old school German restaurant and brewer near the cathedral. A good trip to Cologne should include having a traditional Kolsch beer. Tip: Driving to Cologne? You’ll need a “green sticker” – German law has required that all cars driving in dense urban areas have one. They seem to act as a “carbon offset” requiring drivers using German roads to pay the government a little money for permission to pollute. While it is more expensive to order online then buying one in Germany, I would advise against it. We found that these stickers were not that easy to find and ended up sending us on wild goose chase that required Manon use her high school German. So order online, especially if you have no high school German to fall back on.